"It gets me off the rocking chair," Wheeler said. He said pickleball is not only a great form of exercise; it's also a great social outlet. Players have a good time and meet new friends. And it's not just local residents who show up to play. 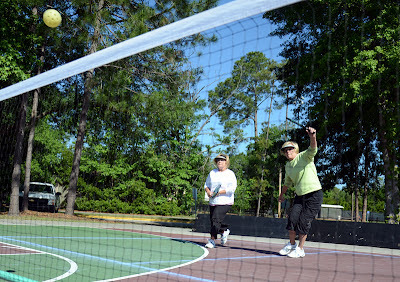 Visitors from all across the country stop in for a game of pickleball while on Hilton Head. Wheeler said in addition to the recreation center and Sun City, groups play pickleball in Palmetto Hall Plantation and Shipyard Plantation on Hilton Head, and in Belfair in Bluffton. Best of all, Wheeler said pickleball is easy to learn. "You won't be a beginner very long," he said.